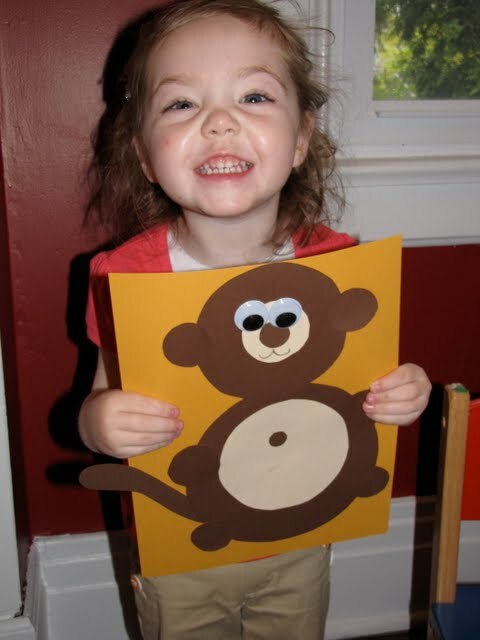 Today we made a monkey using different sized circles (and a tail). I precut the circles and Eva glued them on as we talked about what each body part was and where it would be. Eva is getting to be quite the pro at using the glue stick but I did have to help a little with the smaller circles. We also made some snakes with play dough. I showed Eva how to roll the dough with her palm on the table and with a little assistance she was able to do it. The book "Hug" would go great with this activity!